Tory Burch is a high-end American fashion brand, which creates and manufactures a variety of women's clothing, shoes, and accessories. At the USA Tory Burch online store, you can shop from both casual and more formal options as well as the brand's own sport line, "Tory Sport." With Big Apple Buddy’s personal shopping service, you can now buy direct from the Tory Burch online store anytime, anywhere. Tory Burch has a variety of different dress styles, so you'll be able to find what you're looking for-- whether that's something casual, formal, plain, or bold! 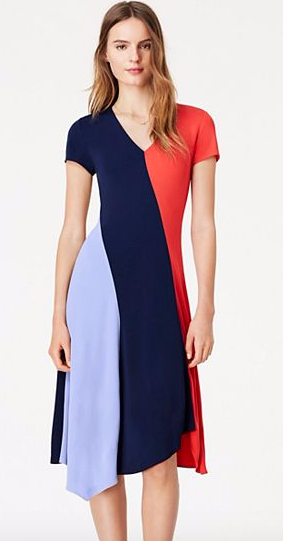 The Walden Dress is a fun and bold option that is made from panels of matte jersey and diagonally placed to create an especially flattering silhouette. This fun and unique pattern will look good on any body type, and the bright colors make it a piece that will stand out in the crowd! This dress has a fluid skirt that falls to just above the knee, which makes it a perfect and sophisticated option for both day or evening. The v-neck and short sleeves make it a great number to wear in warmer weather! You can also shop from a variety off different swimsuits and beach accessories at the USA Tory Burch online store. The Talisay One-Piece has a fun and bright print with abstract, free-floating blossoms, which brings an element of lightness to the look. This suit comes with a keyhole detail in the front, string ties at the neck, and a cut-out back. It's also a suit that is made to last you: it's made from the highest quality Sensitive Fabrics by Eurojersey and features four-way stretch, an impeccable fit, long lifespan, and SPF 50 sun protection! So you can look good while protecting your skin! Tory Burch is also extremely well known for their accessories and handbags. The Marion Embossed Shrunken Shoulder Bag, one of the newest pieces from the brand, is made of leather and has a diamond pattern, accented with a chain-adorned cross-body strap. The inside of the bag features three card slots, so it's the perfect accessory to bring with you on a night out when you don't feel like lugging around your entire wallet. This compact, versatile style is available in three great color options: black, french grey, or dark peony. The black and french grey options are great for everyday use and can be paired with just about any outfit! But if you're looking for more of a statement bag that will really stick out, the dark peony is a unique and elegant choice! 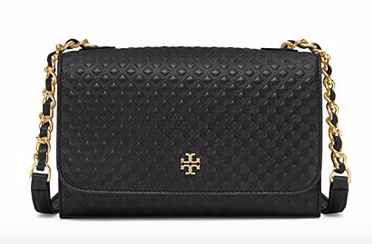 Unfortunately, the USA Tory Burch online store does not currently offer international shipping. However, Big Apple Buddy, your personal shopper, can help you buy products direct from the official USA Tory Burch online store and ship them to your doorstep, no matter where you are in the world. We offer international shipping to over 110 countries including Australia, Austria, Azerbaijan, Bahrain, Belgium, British Virgin Islands, Brunei, Bulgaria, Canada, Chile, Costa Rica, Croatia, Czech Republic, Denmark, Estonia, Fiji, Finland, France, French Polynesia, Germany, Gibraltar, Greece, Greenland, Hong Kong, Hungary, Iceland, Indonesia, Ireland, Israel, Italy, Japan, Jordan, Kuwait, Latvia, Liechtenstein, Lithuania, Luxembourg, Macau, Malaysia, Maldives, Malta, Marshall Islands, Mauritius, Monaco, the Netherlands, Netherland Antilles, New Zealand, Norway, Oman, Poland, Qatar, Romania, San Marino, Saudi Arabia, Serbia and Montenegro, Seychelles, Singapore, Slovak Republic, Slovenia, Spain, South Africa, St. Lucia, Sweden, Switzerland, Taiwan, Thailand, the UAE, the UK, Vatican City, and Vietnam. If you would like to buy from the USA Tory Burch online store, simply let us know which items you would like to order (by filling out the form below) and we’ll get back to you with a free international shipping quote within 24 hours!